Why choose SENICC gaming headset? 1. 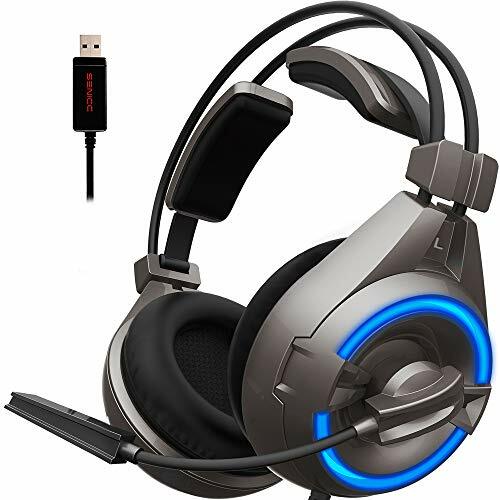 【High Compatibility】This gaming headset works with PC, laptop, Mac(Support music and microphone, except customized sound effect), PS4(Connect the USB port to PS4 console),etc. 2. 【Comfortable Feeling】High grade wearable leather, soft texture, delicate and comfortable touch, it has an elegant appearance. 3. 【LED Light】Glaring LED lights designed on the ear cups to highlight game atmosphere. 4. 【Practical Design】 Decompressing belt 45°adjustable flying wing to reduce head pressure, make your headset has a better extensibility. 5. 【Rotatable, Noise-cancelling Mic】The mic reduces distracting background noise so you're clearly heard. Please enjoy music at moderate volume to prevent adverse effects on your hearing. Please wear the product carefully when driving or riding to avoid impact on driving safety. ★ WIDE COMPATIBILITY -- This A6 gaming headset is compatible with PC, Computer, Mac(Support music and microphone), PS4(Connect the USB port to PS4 console), Laptop, Tablet, etc. ★ FLYING WING LIGHTWEIGHT DESIGN -- With our latest high-tech design,the headband can automatically adapt to your size, which allows you to play for hours in complete comfort. Flying wing and self adjusting head beam well suits for all gamers at any age. ★ SPLENDID AMBIENT NOISE ISOLATION -- The rotatable noise-cancelling mic reduces distracting background noise so you're clearly heard. The omnidirectional noise reduction technology ensures that microphone picks up your voice clearly in game or online chat. ★ STEREO LEATHER EARMUFFS -- Built-in industry leading high precision 40mm magnetic neodymium driver pursues a more immersive surrounding sound experience.The high quality over-ear leather earmuffs can pick up sounds with great sensitivity and comfort. ★ EFFORTLESSLY VOLUME CONTROL -- High strength, soft texture,durable and anti-pulling 86inches USB cable with rotary volume controller and glaring LED light well active the atmosphere of your gaming. If you have any questions about this product by Senicc, contact us by completing and submitting the form below. If you are looking for a specif part number, please include it with your message.